ICT-AGRI (Information & Communication Technology and Robotics for Sustainable Agriculture) has launched their 2017 call on farm management systems for precision farming. Funded by the European Commission’s ERA-NET scheme, ICT-AGRI aims to contribute to the development of an eco-efficient, resource-efficient and competitive agriculture through an enhanced and improved use of ICT and robotics. Precision Farming involves a number of digital technologies, including the Internet of Things and automated agricultural machinery, and is recognised having significant potential for the sustainable intensification of primary food production. Proposals must be submitted by 21 April 2017. Agriculture and Agri-Food Canada (AAFC) is offering a Postdoctoral Fellowship opportunity investigating the environmental impacts of dairy farm systems. A candidate is sought to monitor nutrient balance on dairy farms in an attempt to reduce nutrient losses in the form of environmentally damaging compounds, using the whole-farm models Holos and IFSM. 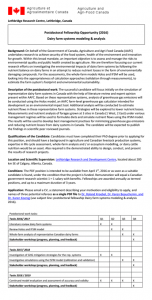 The candidate must have a PhD and a background in agriculture and Canadian livestock production systems, expertise in life cycle assessment, whole-farm analysis and / or ecosystem modelling, or dairy cattle nutrition. The PDF location is the Lethbridge Research and Development Centre in Canada, and the position is intended to commence on 1 April, 2016. Faculty from Penn State’s Departments of Animal Science, Veterinary and Biomedical Sciences, Plant Sciences, and Agricultural Economics are developing the world’s first Dairy Production and Management MOOC (Massive Open Online Course). The course is designed to deliver fundamental knowledge and best practices related to sustainable dairy production systems in their broadest sense. Participants will gain a broad and comprehensive understanding of all aspects of dairy management including genetics, nutrition, reproduction, animal health, milk hygiene, farm economics, and sustainability of dairy production systems. There’s something in this course for everyone, whether you are just looking for the basics or have years of experience in the dairy industry. The course is launching March 7th, 2016. For more information and to register please visit the course’s website: https://www.coursera.org/course/dairy.